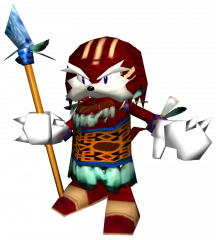 Pachacamac (mistakenly spelled Pochacamac in Sonic the Comic) was the ancient Chieftain of the Knuckles Clan echidnas, and father of Tikal. The old echidna is shown with a furry muzzle (unlike other echidnas, possibly due to his advanced age) and he exhibits a constant squint; although this quirk was absent from his Sonic X portrayal. Four thousand years ago, Pachacamac orchestrated the attack on the Emerald Shrine which enraged Chaos Zero, and he was killed in the ensuing carnage. Being long-dead, Pachacamac has only ever been seen in flashbacks: during Sonic Adventure thanks to Tikal (in her discorporated form as a glowing ball), and just before the last boss in Sonic Chronicles: The Dark Brotherhood, when Imperator Ix briefly recalls the face of his ancient foe. "The chief's daughter loved her grandmother so much. The country was a lot smaller back when Grandma was alive. But the Chief wanted to expand his kingdom. After Grandma's death, he made his move... He did well. He quickly took over the surrounding areas. But his daughter didn't like what he'd done..."
"Our chief is Pachacamac. He's fearless. Brave. Bold. With him we can never lose. We owe everything to Pachacamac." Inheriting the leadership of the Knuckles Clan after his mother's death, Pachacamac proved himself a greedy warmonger, in stark contrast to the pacifistic tendencies of both his daughter and mother. As Sonic Chronicles later reveals, Pachacamac's wars brought him into conflict with the Nocturnus Clan, a seperate nation of echidnas ruled by Imperator Ix. Tikal did try to talk her father out of his belligerent ways, but ultimately failed, leaving Pachacamac to turn his eyes on the Emerald Shrine - considering the stones as key to the clan's continued survival and victories. Ignoring his daughter's pleas, Pachacamac's warriors attacked the Shrine, slaughtering the Chao and enraging Chaos Zero, who transfromed into Perfect Chaos. The Knuckles Clan's civilization was destroyed in one fell swoop; Pachacamac and his warriors killed. Chaos was prevented from drowning the entire world only by the intercession of the Master Emerald, responding to Tikal's pleas to prevent further carnage.